Upper sliding door track for 1/2" material. Used with D5884S. 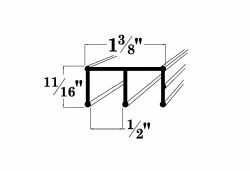 Satin anodized in 12 ft. lengths or in 6 ft. and 4 ft. sets.